Slow Cooker BBQ Pulled Pork is an easy, delicious way to feed a crowd. 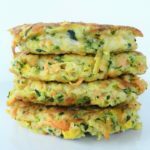 These stick-to-your-ribs comfort food sandwiches with fresh cole slaw will have guests clamoring for more. 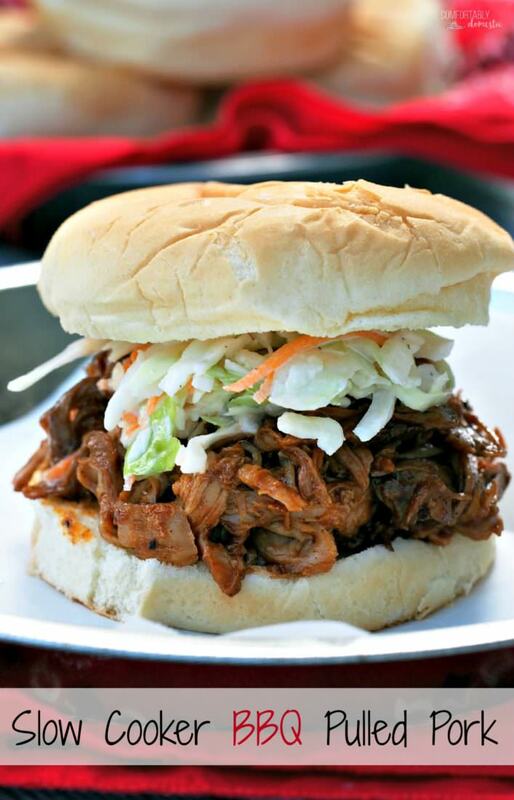 Slow Cooker BBQ Pulled Pork is a favorite recipe that’s a go-to staple in our family. 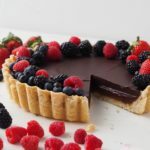 The simple, step-by-step recipe was originally posted years ago, and was in desperate need of updating. I hope that the new photos and updated text have you wanting to take a big bite while reaching for the napkins to sop up all the extra barbecue sauce. A good, saucy pulled pork is one of my favorite dishes to serve a crowd. My Grandma used to make BBQ Pulled Pork it when our extended family got together because it was easy, and everyone loved it. 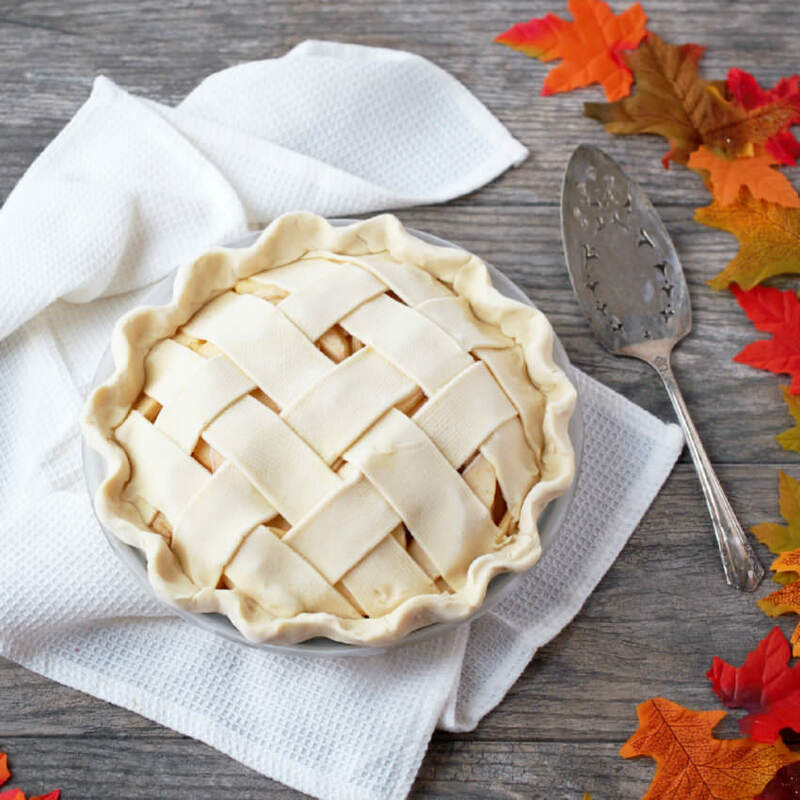 Thanks to a trusty slow cooker, it takes almost no time to put together and your guests will be thrilled with the tasty results. 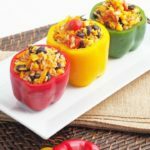 This dish is great to have with friends after an afternoon spent outdoors, or while watching football or hockey. No guests? No problem! The finished pulled pork freezes beautifully! Spray the inside of the crock with a little olive oil. Yes, I am wearing blue nail polish. My 7 year old picked it out–he’s my fashion stylist. My experience with pork tenderloin roasts is that they are very lean. If yours has a layer of fat on one side, trim most of it away. Leave enough fat to to retain moisture and flavor, but not so much that you have to fish out sheets of it before shredding the pork. Place the pork roast into the prepared crock. Sprinkle a hefty pinch of salt and pepper over the roast. 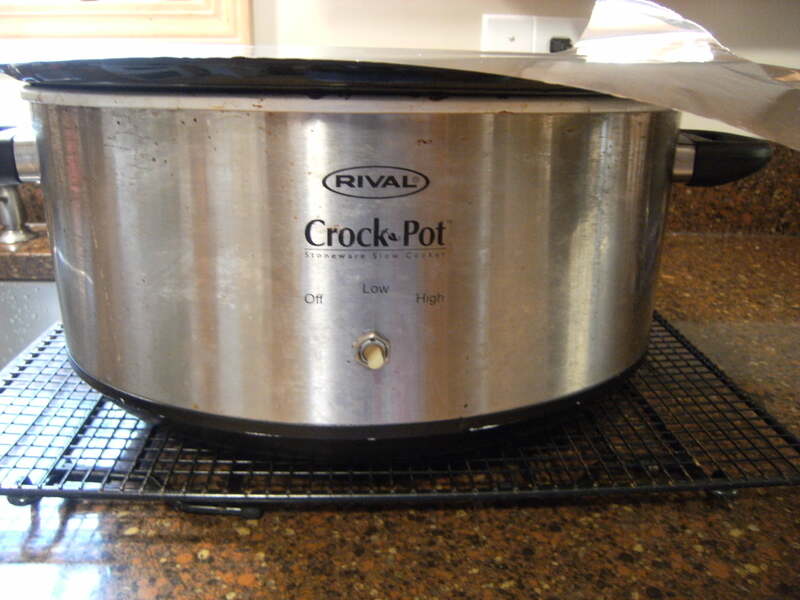 Place a large sheet of aluminum foil on top of the crock. Cook the roast on low for 6 to 8 hours. You’ll know it’s done because there will be a lot of delicious juices at the bottom of the pot. Grab two forks and start pulling the pork. Pierce the meat with the forks right next to each other, then pull them apart in opposite directions. When the pork easily falls apart when pulling the forks, it’s ready. 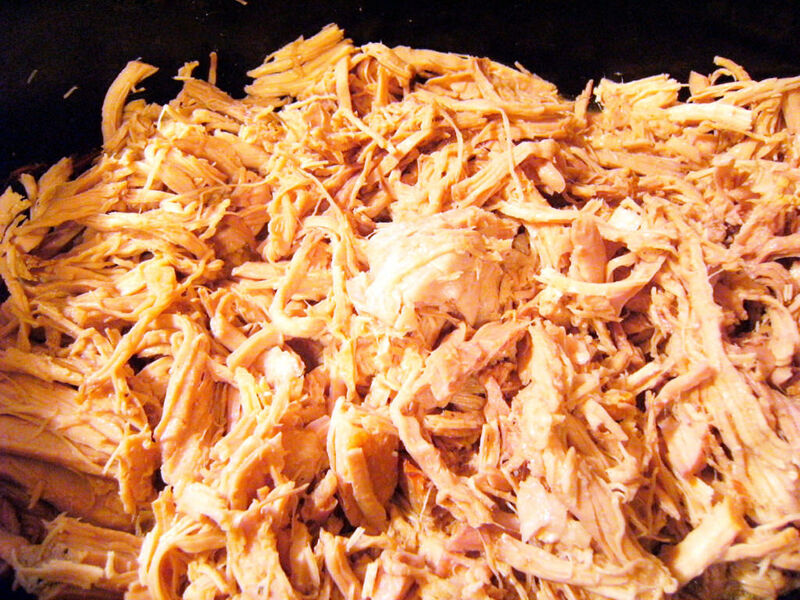 Afterward, you’ll have a pile of tender shredded pork. Stir the pork shreds around the crock so that it absorbs all the juicy goodness in the bottom of the pot. Pour the barbecue sauce over the tender meat and give it all a good stir. I usually add about 2 cups of barbecue sauce, but more or less may be added, depending on the preferred level of sauciness. 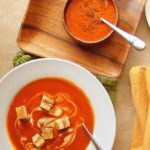 I’m a medium-sauce kind of gal myself–just sticky enough to hold it all together, but not quite to the level of sloppy. Put the lid back on the crock and let it simmer in the barbecue sauce for at least 30-60 minutes before serving. Now would be an excellent time to make the cole slaw. Grandma always served pulled pork sandwiches with cole slaw on top. I’ll admit that for years, I just asked whomever was passing a KFC on the way over pick up some of their cole slaw. KFC cole slaw is sweet and delicious. I recently decided to try a lighter, tangier slaw made from scratch. I tell you that not only is this slaw darn tasty, its all but replaced the KFC variety on our pulled pork sammies. Juice the lemon(s) into a small bowl, to measure 3 tablespoons of juice. 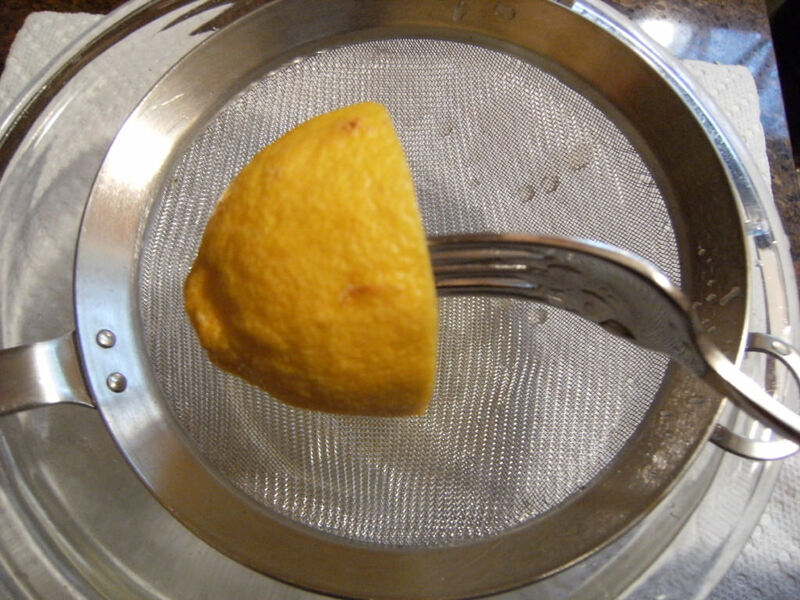 I’m kind of lazy, so I juice lemons over a small strainer so I don’t have to fish out the seeds later. Add the salt, pepper, cumin, and minced garlic to the lemon juice. Give it a quick whisk to combine. 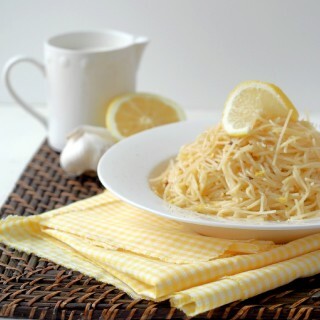 Then slowly drizzle in the olive oil, and whisk briskly at the same time to emulsify the oil into the dressing. Taste, and adjust seasonings, if necessary. Place the cole slaw mix into a large bowl. Cole slaw mix is found with the prepackaged “bag” salads at the grocery store. It’s typically a mix of shredded white cabbage, with a little purple cabbage and carrots thrown in for color. 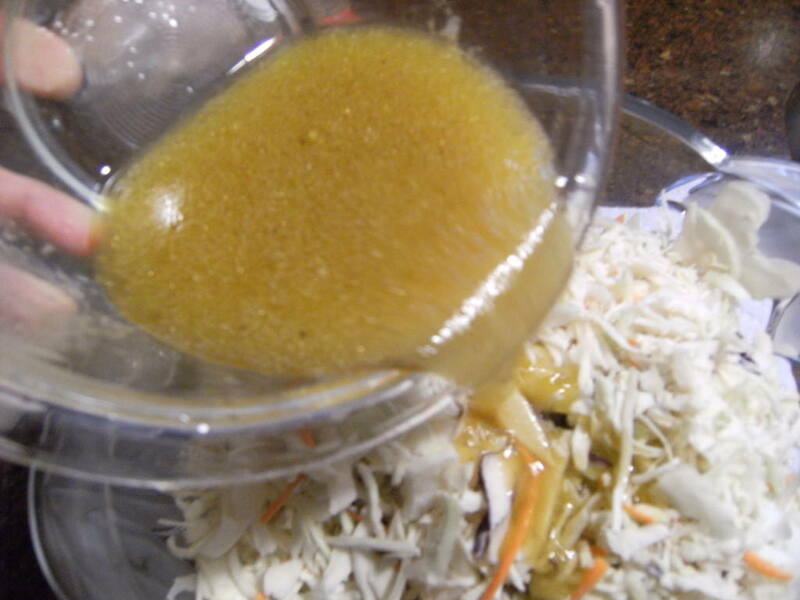 Toss the cole slaw in the dressing until well coated. It may look like there’s not enough dressing, but hold tight. The cole slaw will compact a bit in the dressing as it sits. Cover and refrigerate for at least an hour or so to give the flavors a chance to permeate the slaw. 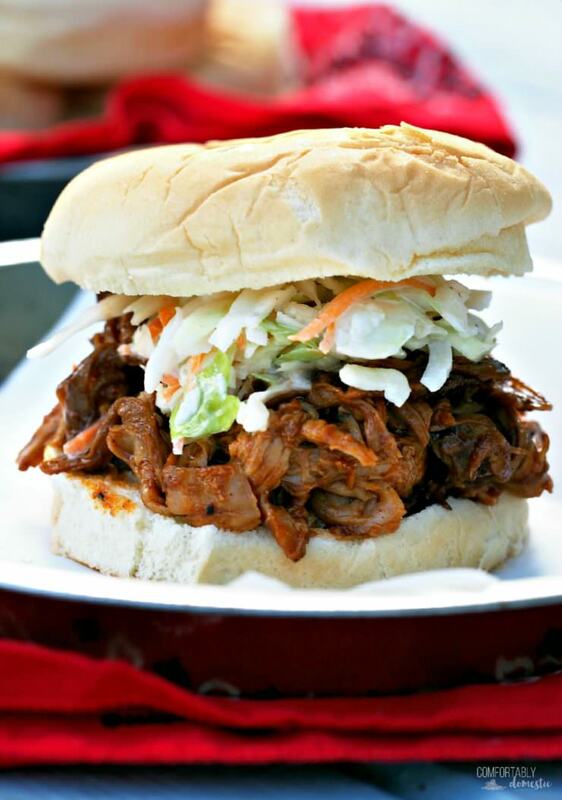 Slow Cooker BBQ Pulled Pork makes an awesome sandwich. 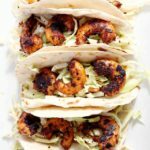 For a change of pace, try wrapping the pork in tortillas and top with the slaw for a barbecue taco kind of arrangement. My gram liked to pile the pork onto half of a hamburger bun before adding a bit of cole slaw to the top. It was her opinion that pulled pork sandwiches “are much nicer eaten open-face,” with a knife and fork. That was her Danish heritage shining through. In my house, we toast the buns, pile on the pulled pork, a slice of cheese, add a little cole slaw, and plop the other half of the bun on top. We eat them with our hands. These apologetically messy sandwiches are worth every bit of mess because the scrumptious flavor more than makes up for it. Just don’t tell Grandma that I said so. Slow Cooker BBQ Pulled Pork is the hit of every pot luck! 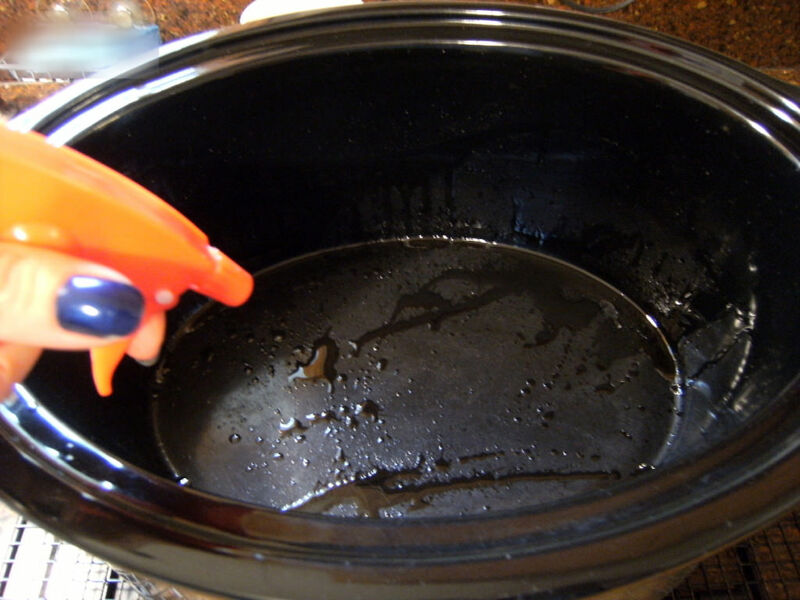 Spray the inside of crock pot with cooking spray. 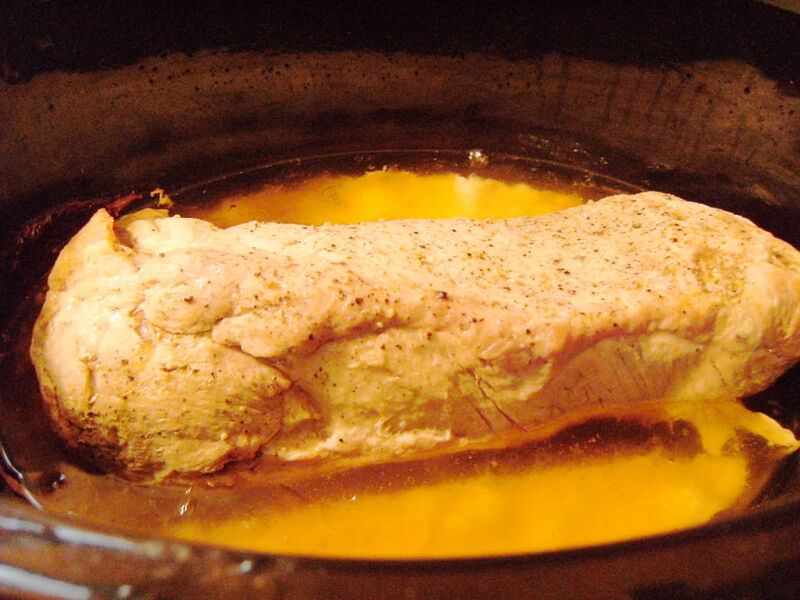 Trim most of the fat from a pork tenderloin roast. 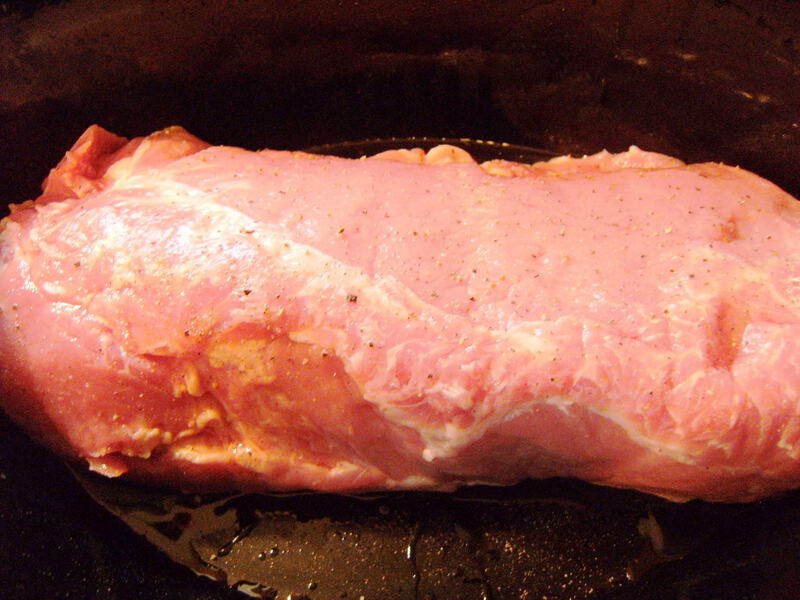 Place the trimmed pork roast in the crock and cover the top of the crock with with aluminum foil. 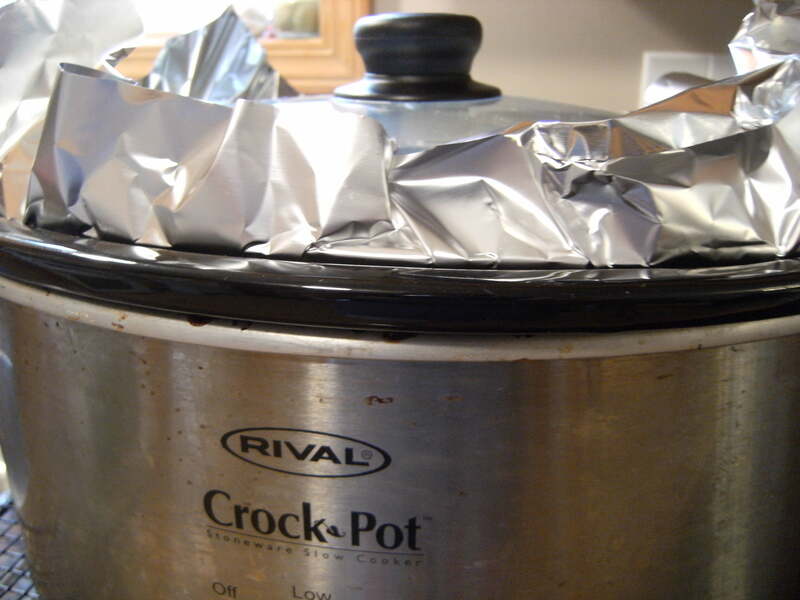 Place the lid on the crock, and then wrap any foil hanging out from under the lid around the top of the lid. Cook the pork on the LOW setting for 6-8 hours. While the pork is roasting in the slow cooker, prepare the cole slaw by juicing the lemon(s) into a small bowl, to measure 3 tablespoons of juice. 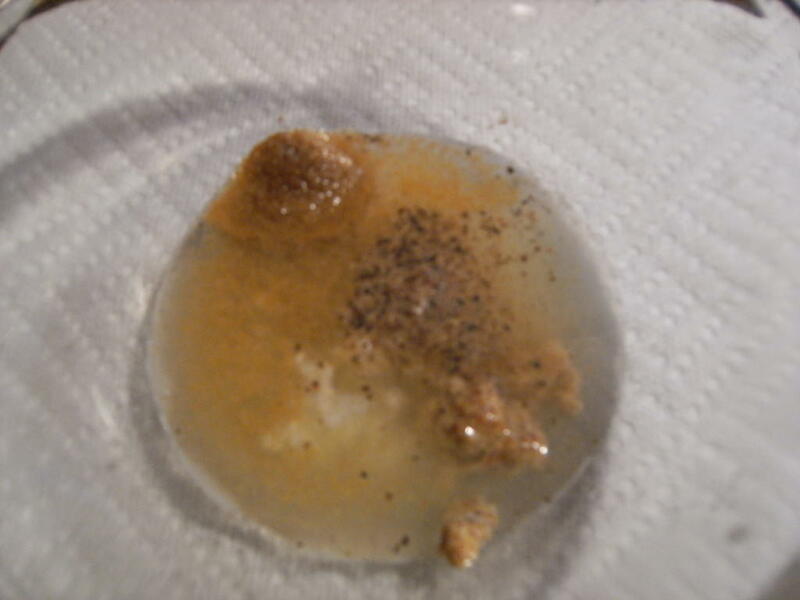 Add the salt, pepper, cumin, and minced garlic to the lemon juice. Give it a quick whisk to combine. 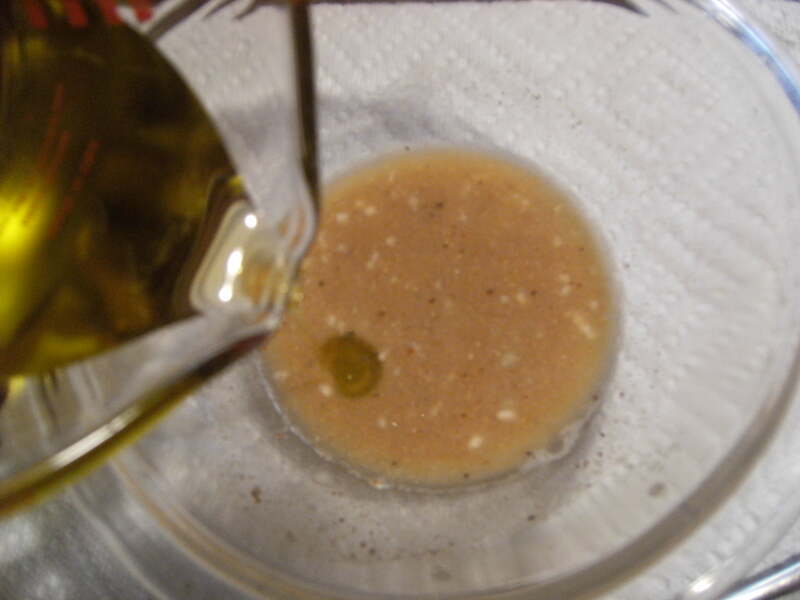 Slowly drizzle the olive oil into the bowl while also whisking briskly to emulsify the oil in the dressing. Taste and adjust seasonings, as necessary. Place the cole slaw mix into a large bowl. Toss the cole slaw in the dressing until well coated. It may seem like there is not enough dressing, but hold tight. The cole slaw will compact a bit in the dressing as it sits. Cover the slaw with plastic wrap and refrigerate for at least an hour to give the flavors a chance to permeate the slaw. Once the pork roast is nice and tender, remove lid and foil from the slow cooker. 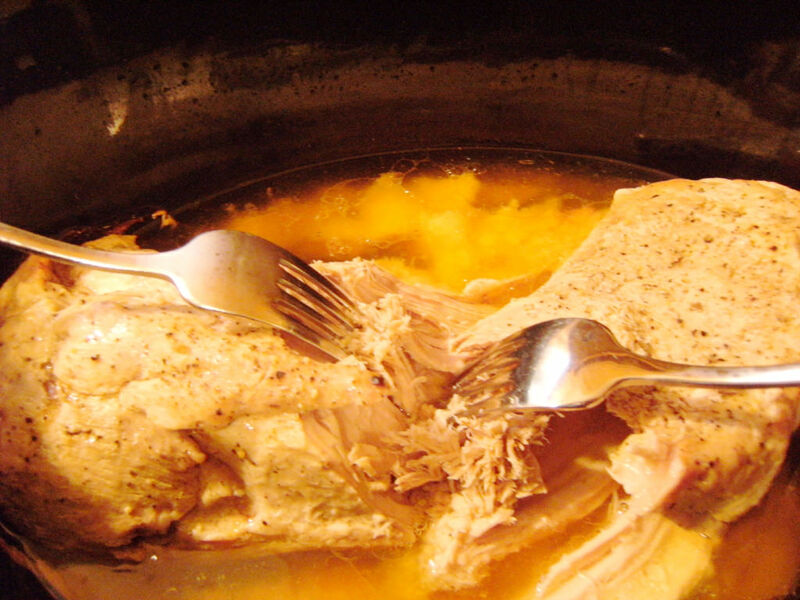 Shred pork roast by piercing it with two forks near each other. Pulling the forks away from each other in opposite directions, thus “pulling” the pork.Once pork is shredded, stir it into any juices in the crock to seal in the juices. 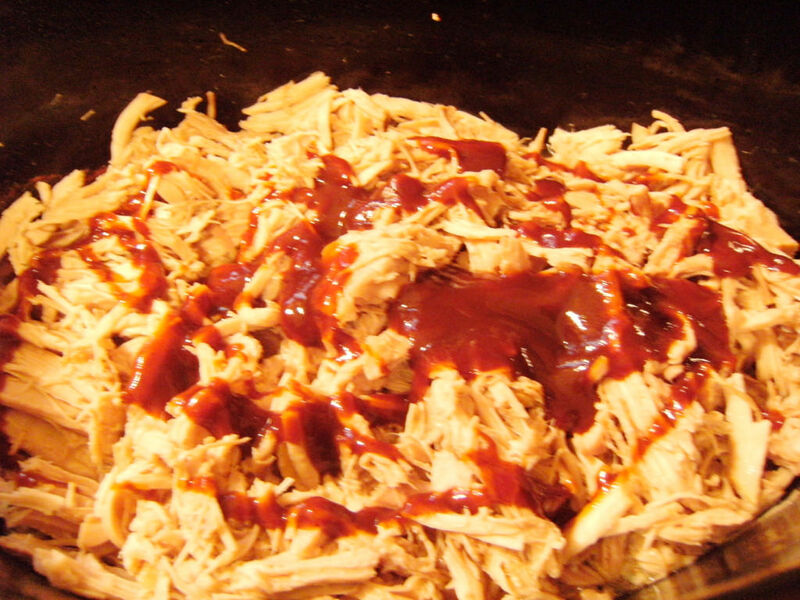 Pour the BBQ sauce in stages over the shredded pork, stirring well to coat, to achieve the desired level of sauciness. 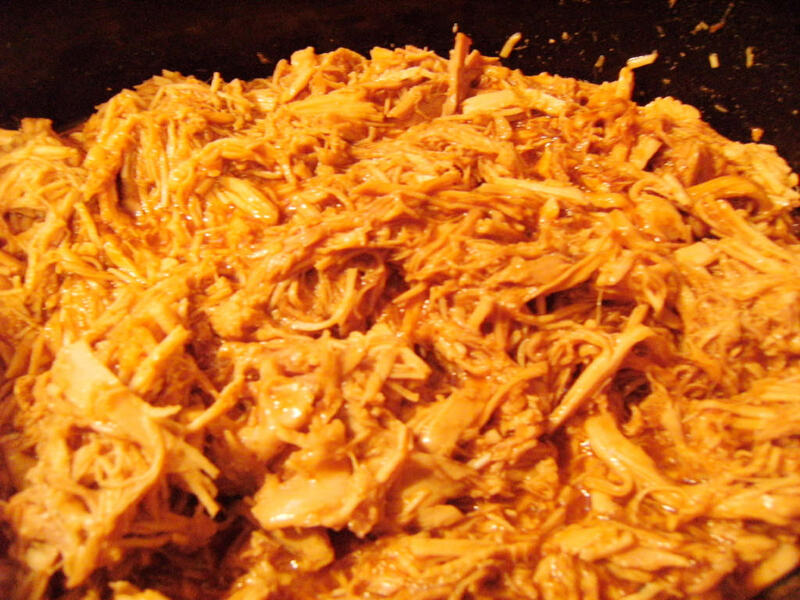 For extra saucy pulled pork, add more sauce, to taste. Serve barbecue pulled pork on toasted buns with a slice of cheese, sweet and spicy pickles, and pile of cole slaw on top, as desired. Cole slaw mix can be found with the prepackaged "bag" salads at the grocery store. It's usually a mix of shredded white cabbage, with a little shredded purple cabbage and carrots thrown in for color. Pulled pork is one of my favorite things to make and I love the tip that you give with the foil. I tend to do that with my kalua pork - makes the pork sooooo good! I love this idea for feeding a crowd! Looks scrumptious! I love coleslaw on a pulled pork sandwich and AGH, these photos are killing me! Looks incredible. We love slow cooker pork like this - especially with that crunchy slaw! This is my favorite way to enjoy pork! 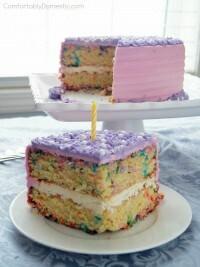 Think I need to make some this weekend now! That sandwich looks delicious, I want one! They are so simple and delicious. You'd love it! I love pulled pork! Perfect for football Sundays! My grandma insisted on cole slaw on top. It's surprisingly good! This looks incredible! Pulled pork is my very favorite way to prepare pork. I need to try this! Hooray! I have pork in my crock pot, as well! It's that kind of day. The smell really does taunt you all day long! Yes, I love making crock pot meals. I made bbq beef with london broil for a holiday party and everyone ate it up quickly! A bbq sandwhich with coleslaw on the top sound scrumptious! London Broil BBQ beef sounds wonderful! Everybody seems to love shredded meat. So nice of you to stop by! Pulled pork is one of our favorite "slow cooker" meals, too. And your house smells wonderful all day while it's cooking. Two "thumbs up" on the blue polish from me, too. Looks great, and I love that it looks a little metallic. Very rocker chick. This is totally gorgeous. I have never tried shredding the pork. I think I will try it next time. This is the most random thing but I just have to say how impressed I am with your blue nailpolish! I wish I could carry off a color like that but nope...on me it just looks kind of sad. The pulled pork looks really good and I don't even eat meat! Thank you, Ameena! I live in a house teaming with testosterone, so I have to add a splash of color or a little bling every chance I get. This is going to sound totally dumb, but I have been struggling trying to figure out for to get meat to have that lovely pulled look, and now I get it, two forks. [please don't judge me, my mother doesn't cook, and I was born without a cooking instinct] ps, I love the blue nail polish, I think it's hot! No judgement here! :) I used to thing that I had to shred the meat by slicing it to bits with a knife. Then my Grandma showed me how she did it, and all of a sudden the name "pulled pork" made sense! Thanks on the polish! I wasn't sure if I could pull it off, but it makes an excellent pedi color. Love: Topping a sandwich with coleslaw. I was not familiar with this phenomenon until maybe...two years ago? The flavor combination it produces is just unreal. Way to tell it on the mountain, lady! oh yum! I love slow cooked meals...and bbq! Always with coleslaw...you mind reader, you. 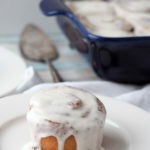 I will definitely make this soon...well, as soon as we return from Haiti...can't believe we are actually leavin TOMORROW. Cheers, cathy b. Now this is serious!!! 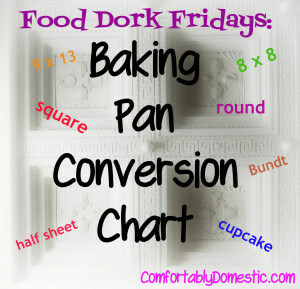 And I love to cook using a crock pot. This is going on the menu list for next week. Thanks bunches. Will let you know!!! Thanks for the help. I'm sure it will be wonderful. You were right!! It was so yummy!! Thanks for the extra tutorial. You're wonderful!